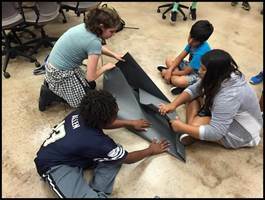 The STEAM Team Summer Academy provides quality educational programming for middle school and high school students. Over the course of a week students are engaged in hands-on learning in science, technology, engineering, arts and mathematics. Student participants engage their creativity, enhance their approach to problem solving, and develop communication and critical thinking skills. The daily activities include discussions around the United Nations Sustainable Development Goals, designing and building complex chain reaction machines, exploring mathematical concepts through folding, team building through fitness activities, arts, sciences, and goal setting in preparation for transition to high school, college and career. The Academy begins with a pre-Academy orientation for students and their families on Sunday, and culminates with the Youth and Community conference on the Saturday following the week of activities. The Academy is a collaboration of faculty from the School of Leadership and Education Sciences, the Shiley-Marcos School of Engineering, and the College of Arts and Sciences. How many marbles can we get in there? Students creating a story through theater. Monday, August 6 – Friday, August 10, 9:00 a.m. – 4:00 p.m. Lunch & snacks will be provided daily. Sunday, August 5 , 2:00 p.m. – 4:00 p.m.
Saturday, August 11, 9:00 a.m. – 4:00 p.m. Create their own works of art. Learn how to use the middle and high school years to prepare for college and careers. Enrolled students will learn from University of San Diego faculty, students and alumni from the Department of Mathematics and Computer Science, the School of Leadership and Education Sciences, and the Shiley-Marcos School of Engineering. 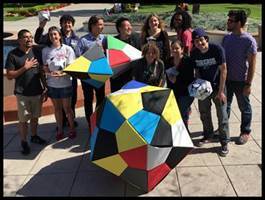 Huge origami regular icosahedron. What an accomplishment! opportunity for the students to meet and participate in their first team-building activities together. Develop the Common Core Mathematical Practices and the Next Generation Science Standards Engineering Practices. Program Directors: The STEAM Team Summer Academy is run by a team of three University of San Diego Faculty- Odesma Dalrymple, Perla Myers, and Joi Spencer. Dalrymple, Myers and Spencer are accomplished educators with expertise in STEAM instruction across the K-16 pipeline. 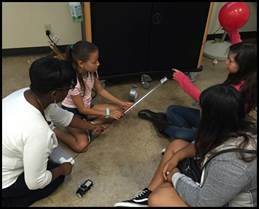 In addition to providing the conceptual development of the STEAM Team Summer Academy, they serve as lead instructors for the engineering and mathematics learning experiences at the camp. Dalrymple, Myers, and Spencer coordinate all aspects of the Academy including the selection, hiring and supervision of instructors and student-assistants, and the coordination of the camp schedule and activities. Course Fee: $375.00. A 10% discount is available for USD Employees. Space is limited. For enrollment questions, contact Perla Myers pmyers@sandiego.edu. Learn More: If you have questions regarding this summer program, please contact Joi Spencer joi.spencer@sandiego.edu, Odesma Dalrymple odesma@sandiego.edu, or Perla Myers pmyers@sandiego.edu. The S(TEAM)2 Summer Academy is a collaboration of University of San Diego faculty from the School of Leadership and Education Sciences, the Shiley-Marcos School of Engineering, and the College of Arts and Sciences (Department of Mathematics).